Ethnic rituals and languages under increasing threat as transport and communication access improves to remote areas. Hu Yongqi reports from Qiandongnan. Tucked away in the sprawling hills and mountains of Southwest China's impoverished Guizhou province, Tonggu is a village that almost defines the word "remote". To get there from the nearest city takes three hours on narrow, pockmarked dirt roads that would test the endurance of even the most ardent traveler. Tonggu's seclusion has for decades played a pivotal part in protecting the rare rites and rituals of its 2,000 or so residents. Yet, like in other rural parts of China, the cultural customs of this village in the Qiandongnan Miao and Dong autonomous prefecture are today under threat. Every new and smooth road that is built not only paves the way for incoming tourists but is also creating an "escape route" for younger generations, many of whom are leaving their heritage behind. "The remote environment has helped many secluded villages preserve their traditions," said Cao Chunhan, director of the Qiandongnan Ethnic Museum 35 kilometers away in the prefecture's capital, Kaili. But as this bubble slowly bursts, do villages risk losing more than they gain through modernization? Cao thinks so. He warned that if more is not done to protect these traditions, "they will be confined to history". The changes are already obvious in Tonggu, a predominantly ethnic Miao village known for its watercolor paintings. At its peak in the late 1990s, there were some 500 part-time painters (mostly women) producing the artwork. Today, there are just 20. Apart from the lack of interest among young people, residents also blame the dramatic decrease on the sheer number of farmers who have left their land for better-paying jobs as migrant workers. Ironically, talented villagers could potentially earn healthy salaries if they stuck with Miao watercolors. 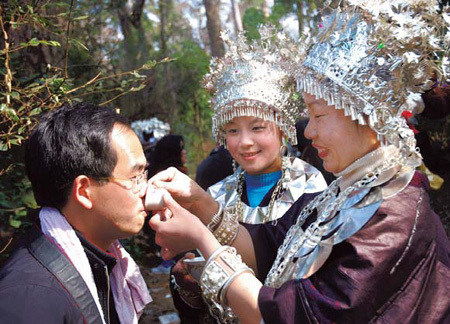 Wang Shengcai, Tonggu's Party chief, said the industry has generated more than 500,000 yuan ($75,000) in revenue for the village since 2000. Works are sold either at a small gallery in Kaili or directly to tourists visiting the village. "But as more flee villages for cities to make a living, fewer people are willing to learn the traditional handicrafts," said Yang Guangying, 75, a successful painter for more than three decades. She revealed with sadness that her 8-year-old grandson has so far shown no interest in a skill that has played such a big part in their village's history. After noticing that the number of artists was beginning to shrink, in September 2001 the village art association launched an ethnic painting workshop for children. It is now an annual event. Classes run for one month and are led by locally renowned artists Chen Qilin and Zhao Yuanqiao, who coach 33 apprentices every year. Students have gone on to win 10 gold medals and 18 silver medals at prefecture and provincial competitions. However, villagers described the workshop as a drop of water in the ocean - especially as one-third of children hang up their brushes for good after graduating. "Painting doesn't mean money for me, so I quit," said a former student who refused to reveal his name.